From movies to books and television shows, sharks have captivated the minds of people. They have an entire week dedicated to showcasing how they are both monster and nature. They represent the wild and chaotic nature of the deep ocean and bring fear to humans who think of them. The reality is that sharks are pretty tame compared to other killers of the natural world. They hunt their prey and generally avoid human contact unless provoked or triggered, which does not happen a lot. On average, sharks are reported to attack humans about 70 times or more every year. In 2011, only 11 people were killed in a shark attack. More startling, it is estimated that humans kill over 100 million sharks every year. This makes the shark attacks on humans look tiny compared to the effects humans have on sharks. The image that we have of sharks stands in contrast to their reality and is something that we must change. As we encounter other shark species, some of which are extremely rare, it becomes increasingly important to learn and understand them instead of hunting them down for food, sport, or by accident. Recently, a very old and very rare species of shark was spotted off the coast of Portugal. Called the frilled shark, it is considered a prehistoric species because the species has been around for about 80 million years. To put that into perspective, modern humans have only been around for 200,000 years. There are over 500 species of shark around the world. They inhabit a variety of environments, mainly in saltwater. There are a few freshwater sharks that live in rivers, but they also are capable of living in seawater. They range from as small as 6.7 inches to as big as 40 feet. Sharks belong to the superorder Selachimorpha and fossil evidence suggests that they originated in the Ordovician period, which was 450–420 million years ago. This was a time before most plants and land vertebrates. The fossils in question are a huge abundance of teeth from ancient sharks because they were capable of producing tens of thousands of teeth over their lifetime, and some scales. It is difficult to get full fossils of sharks because when they die, their skeleton is broken apart and scattered in the water. Ancient shark fossils can be categorized into two groups: Xenacantida, which went extinct about 220 million years ago, and the hybodont. Xenacantida inhabited freshwater environments and was worldwide while hybodont were in both saltwater and freshwater. Now, while we generally assume that sharks are these old and ancient species that represent the ancient past, 2014 study showcased that they were not. Examining a well-preserved fossil, the researchers found that sharks underwent extensive evolution since they have existed. Modern sharks popped up around 100 million years ago after the two ancient groups were extinct or almost extinct. This was before the dinosaurs went extinct. Sharks during this time gained large sizes, like the megalodon. An early paper on modern sharks suggests that an abundance of fast swimming prey allowed the sharks to succeed because of sharks, which had evolved to be fast, agile, and avid hunters had the tools to deal with these new food sources. While they were not contested, they nonetheless prevailed. The end of the Cretaceous period, 65 million years ago, marked the great catastrophe that wiped out the dinosaurs and the hybodonts, the last of the ancient sharks. Among the survivors were the modern sharks. The rare frilled shark was found off the coast of Portugal by researchers who were working on a European Union project to minimize bycatch, which is the catching of unwanted fish in commercial fishing. The shark was about 5 feet and has 300 teeth. It found 2,000 feet beneath the sea by trawlers. The researchers noted that the shark had a snake-like head and a long slim body. Frilled sharks are extremely rare because they live in very deep depths of the ocean, where humans go rarely. One of the last sightings of a frilled shark was in 2007 when a fisher caught sight of it. This shark was taken to Japan’s Awashima Marine Park but it died within a few hours of being caught because it may have been sick or hurt in some way. It is unusual for frilled sharks to come to the surface and they may do if they are dying or sick in some way. Most of its biology and ecology are not well known because they usually stay in their deep depths and are understudied. 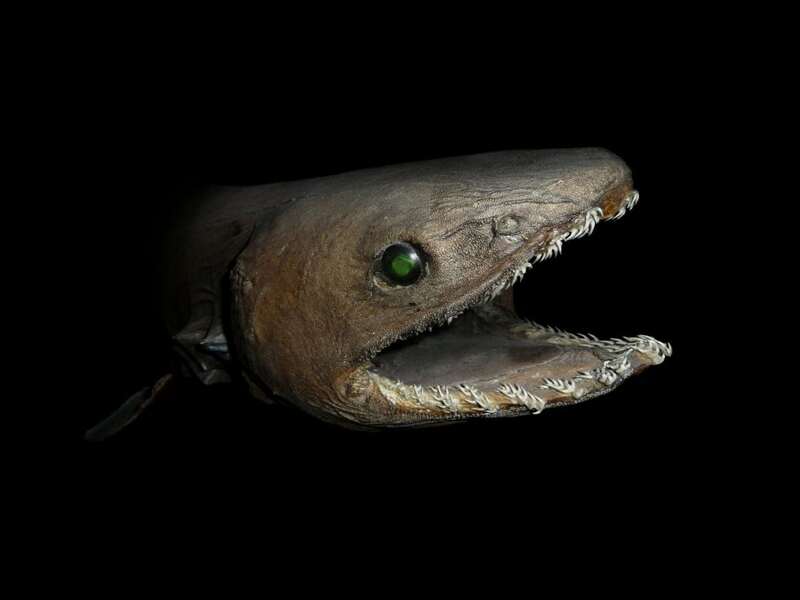 What we do know is that frilled sharks belong to the family Chlamydoselachus, which only contains 2 existing species and a few extinct species. Now, this is a rare species that tend to avoid humans so there could be more undiscovered species. They are found in areas of the Atlantic and Pacific oceans in places like Norway, Scotland, Ireland, Japan, Chile, Australia, and many other areas. They have been found as deep as 5,200 feet below the sea, which is uncommon for either species. Their bodies are quite different from other sharks because they look more like eels or snakes rather than what we might imagine a shark could look like. The frilled shark uses its 300 teeth to feed on squids, bony fishes, and other small prey. Researchers have also found that their stomachs are usually empty, either because they digest things quickly or they go through intervals of not eating. The frilled sharks are referred to as living fossils because they have existed for 80 million years, based on fossil records. This is only 20 million years after modern sharks started to appear. This family of sharks also survived the death of the dinosaurs and preserved many of its original features, which gives us an important insight into how sharks behaved in the past. While they are not an endangered species, they are coming under threat of things like trawlers and commercial fishing because of increased demand for fish. Given their rarity and importance to science, it becomes increasingly important to understand and ensure that we can continue to study them.